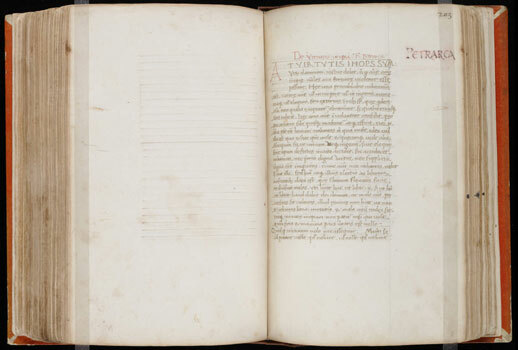 Excerpts from Petrarch’s moral encyclopedia, De remediis utriusque fortune, are joined together in a miscellaneous florilegium manuscript of varied texts on moral philosophy. The reader finds, bound in one volume, the De quattuor virtutibus attributed to Seneca but written by Martin of Braga, the Salomonis dicta, the Manipulus florum by Thomas of Ireland, De temporibus by St. Isidore, miscellaneous definitions and etymologies primarily of Greek words, and verses entitled “Sancti Vitalis verba.” With the De remediis utriusque fortune, Petrarch took his place in the 15th century as one of the principal moral philosophers whose work counseled the reader to cope with good and bad fortune whenever and wherever it manifested itself. As with many miscellaneous books, there is a concern to identify the authors of the texts in MS 380. In the margin we clearly see “PETRARCA,” highlighted in red.